Part 2 of the 3 blog series following Gunners at War. Today covers , how the ground was used for morale boosting games and other events, Arsenal’s recruiting for the front and what happened to the Manor Ground after the outbreak of the Great War. Unlike in WW2 Highbury remained open between 1914-1918 thankfully not party to any direct bombing. In Arsenal’s final game before the cessation of League football, Nottingham Forest were defeated 7-0. 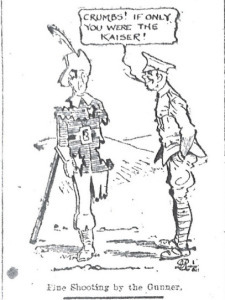 The cartoon is a reference to Arsenal’s fine goal shooting at Robin Hood of Nottingham though a reflected comment by the soldier that the shots of another kind were now required to be aimed at the real enemy. After, and indeed before this game, many of the players, crowd and officials joined up into the forces or worked for the war effort in many different capacities. Owing to the close links that Henry Norris had between the Footballers’ Battalion, Arsenal and Fulham a friendly was played between the teams on 29 January 1916 for the Footballer’s Battalion Charity Fund. The game attracted 6,500 spectators to Highbury and Arsenal won 2-0 with goals by Jock Rutherford and Fred Groves. During the First World War White Hart Lane was taken over by the War Office as a munitions factory in September 1916. A private company was commissioned to produce protective clothing which consisted of mostly gas masks, and consequently Tottenham were forced to alternate their home games between Highbury and Clapton Orient between 1916 and 1919. 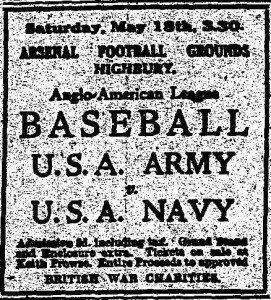 Near the end of the war Highbury was used as the home of the US Navy and Canadian Army sides in a tri-team Anglo-American baseball tournament under the auspices of the London Baseball Association. The US Army used Stamford Bridge as their home ground. In the first game the US Army beat the US Navy 7-6 at The Arsenal’s ground on 18 May 1918. Just before the end of the war 100 injured Belgian soldiers from the King Albert Hospital in Hornsey Rise were given a guided tour around Highbury in the afternoon of 2 November 1918. The Hospital was one of many in the capital that treated soldiers from a specific allied country and had been set up in 1915. After the tour they were treated to tea at the Angel hotel in Islington High Street and entertained by local artistes. After the re-introduction of League football, during the 1919-20 season The Arsenal gave free seats to men wounded in World War 1. It was estimated that these seats cost the club approximately £100 per match at a time when it needed all the money they could get. The Football League continuing after the war started in August 1914 was a contentious issue, but a difficult legal matter as many players were subject to contractual obligations, whereby most players as soon as practicable had either joined up or began working in munitions or mines. On 12 January 1915 in a mass swearing in of 200 men at Kingsway, Holborn, Charlie Satterthwaite joined up for the Footballers’ Battalion. 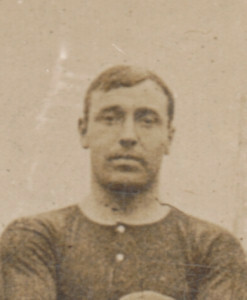 Satterthwaite had been at Woolwich Arsenal between 1904 and 1910, and was the first player ever to score for Arsenal in a top flight league match. Conscription was made compulsory in 1916 and prior to this date the authorities regularly had meetings and events to enlist volunteers. They would regularly address football matches as they had a readymade audience with the large crowds present. One such recruiting drive was at half-time during the Arsenal v Birmingham game on 19 March 1915 when MPs and members of the London County Council spoke to the crowd from various points within Highbury. 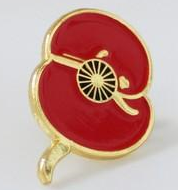 The number of men enlisted was not recorded, but Arsenal won 1-0. 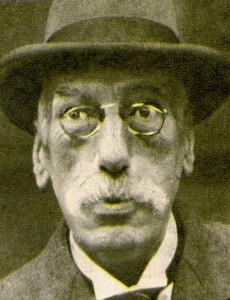 During the First World War Henry Norris, the Arsenal chairman, was very busy as a recruiting agent for the War Office. He was on the executive committee of the Footballers’ Battalion and raised a gun brigade for the Royal Field Artillery, whilst obtaining a commission in the Army and rising to the honorary rank of Colonel. On 13 June 1917, at Buckingham Palace, he was dubbed a knight, by King George V, for his services to the country in raising volunteers for the armed forces. One aspect of the war was deeply ironic for Woolwich Arsenal Football Club. Norris and Hall moved the club in 1913 due to a lack of support, but by 1917 there were 70,000 potential supporters in the munitions factory. After Woolwich Arsenal left Plumstead the Manor Ground was used by Woolwich FC, an amateur concern run by and for Royal Arsenal ordnance workers. It had been set up by a number of locals, many of whom had previously been involved with Woolwich Arsenal. In August 1914, just after the outbreak of the First World War, the club voluntarily folded owing to the specific financial and logistical difficulties they would have faced players, crowd and officials predominantly being involved with munitions works. During WW1 the Royal Arsenal Ordnance Factory expanded rapidly from approximately 10,000 employees at the start of the war to 70,000 at its peak. The Manor Ground, for twenty years the home of Woolwich Arsenal FC, was sold to the Ministry of Munitions in October 1914 to assist with this armament production. By November 1915 the old ground had been razed and replaced with a large case and fuze factory at an estimated cost of £180,000. The majority of these short items were written for the 2014 Centenary Commemoration of WW1 and most appeared in the Arsenal programme under the “Arsenal at War” title last season. Apologies to the originator of the fantastic poppy image but we couldn’t locate who designed it to acknowledge as the source.